The government move has come under severe criticism from the opposition, with Congress leader PL Punia calling it a ploy to induct people with RSS leanings who would then influence government decisions. 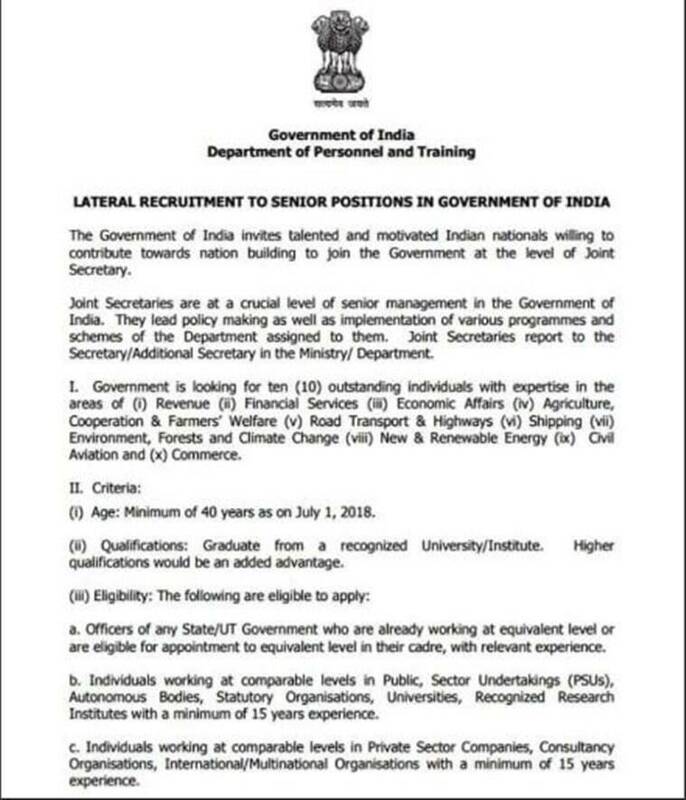 Paving the way for private sector professionals to take part in policy making and implementation of government programmes, the Centre on Sunday invited applications for 10 joint secretary-level posts in several departments through lateral entry. The joint secretary post is usually filled through exams conducted by the Union Public Service Commission. An advertisement published in leading newspapers on Sunday mentioned the government was looking for 10 “outstanding individuals”, even from the private sector, with expertise in the areas of revenue, financial services, economic affairs, agriculture, cooperation and farmers’ welfare, road transport and highway, shipping, environment, forests and climate change, new and renewable energy, civil aviation and commerce. However, the move has come under severe criticism from the opposition, with Congress leader PL Punia calling it a ploy to induct people with RSS leanings who would then influence government decisions. “This is being done so that people who are with RSS or BJP come on this position and will then directly influence the decisions taken by the government,” Punia said. Bihar Leader of Opposition and RJD member Tejashwi Yadav said the government had made a joke out of the Constitution and slammed the moved as a violation of the statute. “”How can this Manuvadi government sideline the UPSC and appoint whoever they like to important posts like joint secretaries without conducting exams? This is a violation of the constitution and reservation. Tomorrow they will appoint a PM and cabinet without conducting elections. They have made a joke out of the constitutions,” Tejashwi tweeted. Seconding Punia, CPI(M) general secretary Sitaram Yechury said the move was an attempt to include ‘sanghis’ in the administrative ranks. “Why are time-tested UPSC and SSC being sought to be undermined? To fill IAS ranks with Sanghis and undermine reservation too, in the BJP’s last few months in office,” Yechury tweeted. Countering the charges, Minister of State (MoS) in the Prime Minister’s Office Jitendra Singh said the decision to introduce lateral entry to 10 joint secretary posts was an endeavour on part of the government to give every Indian a chance to grow. “It’s an endeavour to get the best from whichever source available. It’s motivated with focus on allowing every Indian citizen a fair chance to ensure their growth depending on their potential,” ANI quoted Singh as saying. The NITI Aayog welcomed the move and CEO Amitabh Kant said the move would bring in a vast number of fresh and vibrant ideas. “NITI’s experience with lateral entry has been extremely good. They (candidates) bring in a vast number of fresh and vibrant ideas. (It) Will catalyze UPSC entrants to specialise. The government must also allow deputation of its officers to private sector as well,” Kant said in a tweet. 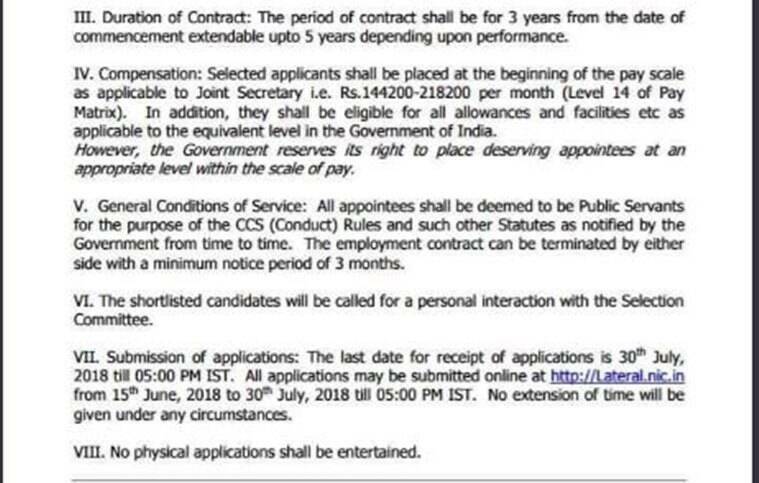 According to the circular issued by the Department of Personnel and Training, the period of contract will be for three years from the date of commencement of service, extendable up to five years depending upon performance. Joint secretaries report to the secretary/additional secretary in the ministry or department. Applicants have to be atleast 40 years as on July 1, 2018 and graduate from a recognised university or institute. Individuals, with a minimum of 15 years of experience, working at comparable levels in public sector undertakings, autonomous bodies, statutory organisations, universities, recognised research institutes with a minimum of 15 years of experience are eligible to apply. Those working at comparable levels in private sector companies, consultancy organisations, international or multinational organisations with a minimum of 15 years experience can also apply. Selected applicants shall be placed at the beginning of the pay scale as applicable to a joint secretary, which is Rs 1,44,200-Rs 2,18,200 per month. In addition, they shall be eligible for all allowances and facilities. The shortlisted candidates will be called for a personal interaction with the selection committee. The last date for receipt of applications is July 30.